Invite guests into your building with the sleek Towerreception desk. The chic design features a silver gray laminate surface and base board that accents the dark finish of the rest of the desk. With two 55"W surfaces, guests will not have to wait long and will have ample space to fill out paperwork. Each drawer and storage compartment is lockable for security. This reception desk is constructed with a laminate finish that will resist scratches from frequent use. On the inside of the desk 15"W locking storage pedestals can be found on each end. One end features a wardrobe cabinet to keep a jacket and extra sweater on chilly days. The other pedestal has a small storage cabinet on top of a supply drawer and a hanging file drawer. Keep papers and pens in the supply drawer and store letter or legal hanging files in the file drawer. The work surfaces each have one grommet hole to keep cords out of sight; Ships ready to assemble. Tribeca Loft Cherry Receptionist L-Desk with Right Return Tribeca Loft Burnt Umber Cherry Dimensions: 68.25"W x 85"D x 43"H Weight: 604 lbs. 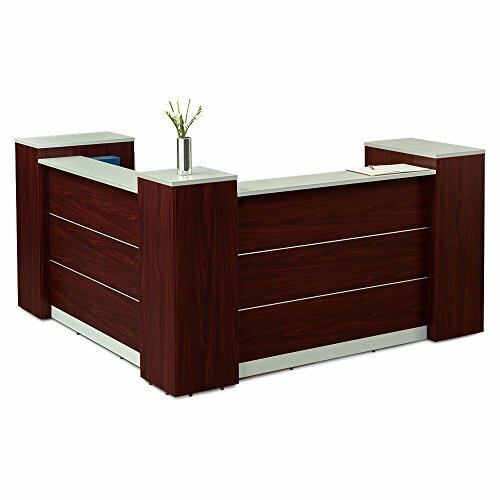 Mira Reception Desk Medium Cherry Finish Dimensions: 72"W x 36"D x 43.5"H Weight: 462 lbs.